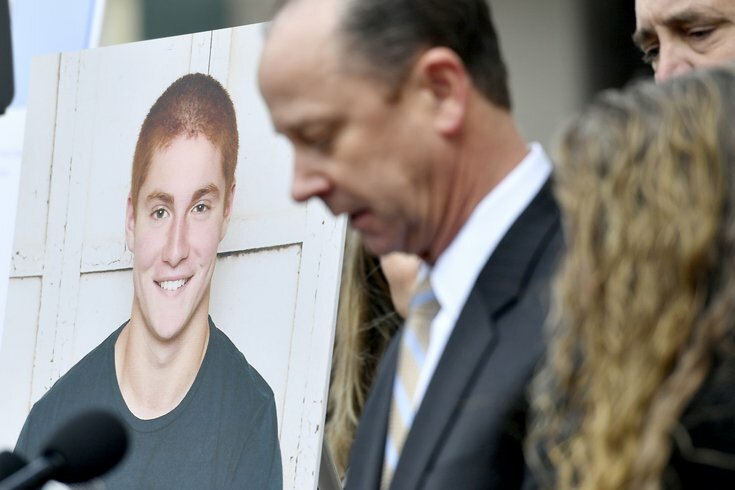 A large photo of Timothy Piazza next to his father Jim Piazza as he speaks about the importance of passing the anti-hazing legislation named after his son outside of the Centre County Courthouse on Friday, March 23, 2018 in Bellefonte, Pa.
Former Beta Theta Pi fraternity member Ryan Burke is the first to plead guilty for his role in the death of 19-year-old Penn State University student Timothy Piazza. Burke, 21, pleaded guilty to all nine charges against him — four counts of hazing, four counts of unlawful acts relative to alcohol and one count of purchase, consumption, possession or transportation of liquor and malt or brewed beverages. Burke reportedly handed Piazza a handle of vodka to drink minutes before Piazza was identified on tape in the fraternity house as being visibly intoxicated. Litigation of this case has been a fierce back-and-forth between the attorney general, prosecutors and judges since Piazza's death in February 2017. In April Attorney General Josh Shapiro appealed the dismissal of more serious charges made against five former members, including involuntary manslaughter. A judge refused to reinstate the charges. Burke's sentencing is scheduled for July 31.